Building on the classic style of the previous 2 ships, the Disney Magic and the Disney Wonder, the Disney Dream is a valiant vessel distinguished for its classic early 20th-century design—which hearkens back to the golden age of cruising—and state-of-the-art technology. As can be expected from Disney, the cruise liner was specially designed with families in mind, combining sleek style and convenient facilities with splashes of magic and cruise-industry firsts—like the splash-tacular AquaDuck, the very first water coaster at sea. Download the Disney Dream deck plans. Youth Clubs fulfill the recreational needs of younger Guests. Kids clubs, activity centers for tweens and teens, and a plethora of unique interactive programs and wondrously themed immerse spaces can be found throughout the ship. Pools aboard the Disney Dream are terrific places to cool down and relax on sun-kissed afternoons. On Deck 11, you’ll find 3 sparkling pools—one for kids, one for families, and one just for adults. 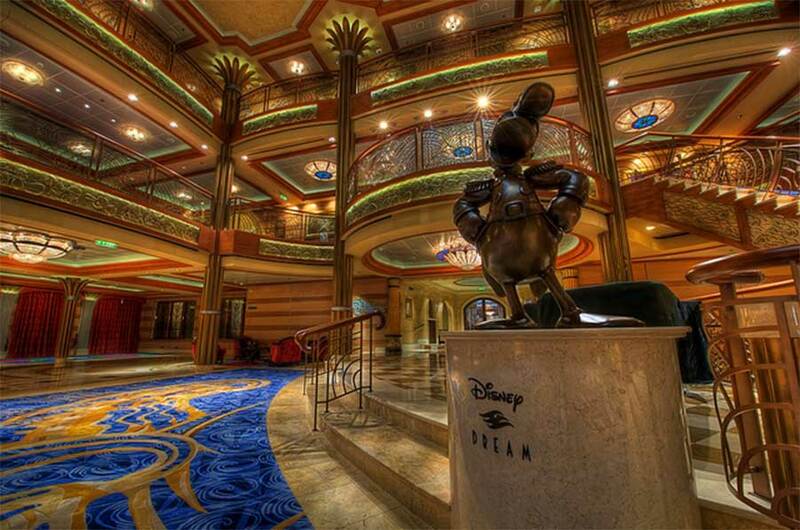 Nightclubs & Lounges on the Disney Dream fill the nights at sea with live music, dancing and socializing. Explore The District—the ship’s adults-only entertainment area, home to 5 distinct lounges and nightclubs. The Disney Dream offers a full service spa, hair salon and fitness center for women and men at the immaculate Senses Spa & Salon—an impressive sanctuary, spanning Decks 11 and 12, Forward of the Disney Dream. Indulge in soothing spa treatments, attain a new look with a complete makeover, or feel the burn on our state-of-the art cardiovascular and weight machines. To step aboard the Disney Dream is to be instantly transported to an age of adventure and wonder, where elegance and sophistication mingle with Disney storytelling and whimsy. Inside is an attention to detail one would only expect from Disney. Lavish decorative murals mingle with sparkling fixtures and furnishings. Original paintings, statues and woodwork envelop Guests in a radiant Art Deco ambiance that is both rich and distinctive. And wondrously themed venues—including charming youth activity clubs, resplendent restaurants, intimate lounges and stunning theater spaces—transport Guests of all ages to faraway places where memory and magic come together. Stroll through the radiant lobby atrium and behold a bronze statue of Admiral Donald—an installment designed by Walt Disney Imagineers to evoke the feeling of fun, adventure and sophistication that can be found throughout the ship.